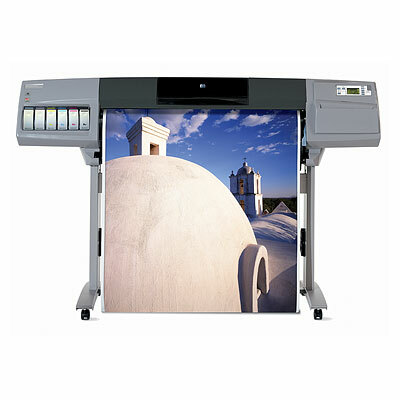 The HP Designjet 5500ps (Dye) is a large format printer that can print on a wide range of media. The Designjet 5500ps (Dye) printer uses HP thermal inkjet technology and HP PhotoREt III resolution technology; the highest print resolution is 1200 x 600 dpi. This machine is quite large, cumbersome and expensive, the consumables and accessories for the HP Designjet 5500ps (Dye) printer are also rather pricey. This printer weighs 220 lbs and measures 78 x 27 x 50 inches. The HP Designjet 5500ps (Dye) large-format printer can handle more complex print jobs as it is installed with Adobe PostScript3. For document finishing, a roll feed, automatic cutter, and sheetfed are standard to the unit and a take-up reel is optional. The HP Designjet 5500ps (Dye) can handle media as large as 42 inches and as long as 300 ft. This workhorse is very reliable and can deliver excellent print quality at a reasonable speed. Users will have no trouble installing and operating it while workgroups can easily share the HP Designjet 5500ps (Dye) inkjet printer thanks to the built-in Ethernet and its compatibility with both Macintosh and Windows computers. Expect the HP 5500ps (Dye) printer as well as the ink cartridges and add-ons to be expensive. The HP Designjet 5500ps (Dye) uses six separate colour ink cartridges and is plagued by compatibility issues with newer operating systems.